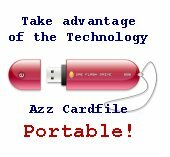 Download: Excel incorporation into AZZ Cardfile. Submitted by Diane. Sample with large Excel sheets. Excel sheets can be edited directly from program interface. Various other objects, images and shortcuts can also be inserted or linked to individual cards.